How does your company maintain the professional stamina of your staff? the professional stamina of your staff? Do you ever consider the difference between your brain and your mind? Often I see these words used interchangeably and I prefer to make an important distinction between the two. I think of the brain as the engine of a car, your body is the body of car, but your mind is the driver. You can argue for better metaphors but for the sake of the argument these will do. A poorly running engine is something the driver can only do so much with. We often think that we are plagued by issues of our mind, when they may in fact be issues with our brain health. So much of society’s focus is on physical health and it has dominated the media with its’ associated cousin, weight loss. Still all very relevant, as modern society in the western world is dominated by obesity, ageing and stress. Those three factors alone create a response from the immune system and an increase in inflammation is the result. It has now been discovered that inflammation can pass into the brain and as such diminish the brain’s ability to produce serotonin and dopamine. Two chemicals essential for mood. Current statistics have 1:3 women suffering anxiety, 1:5 men suffer anxiety and around 1:4 suffer depression. Many of course are co-morbid and suffer both conditions. Around 25% of your workforce suffers a mental health condition. The world health organisation has depression as the number one disability in adults by 2030. The stamina required today is enormous, not just at work, but home and family life all require enormous energy. Accordingly cortisol rises in our bodies as a result of stress, and we all walk into work saying ‘I'm okay, just a bit tired”… yep tired all the time. Ever thought how I look is not how I feel? This was me, in fact I’ve had the condition of depression for about 350,000 hours of my life. They say it takes 10,000 hours to be an experton something. After a decade of cognitive therapy, which I still value, because you can sabotage your mood with a toxic thought life, I began reading about the reduction of inflammation in the body and its effect on the brain and mood. Now after adopting an anti-inflammatory diet, undertaking a sweep of toxic branches of thinking that had embedded themselves in my mind I noticed a major difference in my mood and energy. Prozac was thirty years ago and many people have tried SSRI anti-depressants to moderate levels of success. It is a multi-faceted approach of exercise, mindfulness and an anti-inflammatory dietary intake that includes, probiotic drinks and supplements. I am now creating the first startup in this area, and speak and write on Professional Stamina. 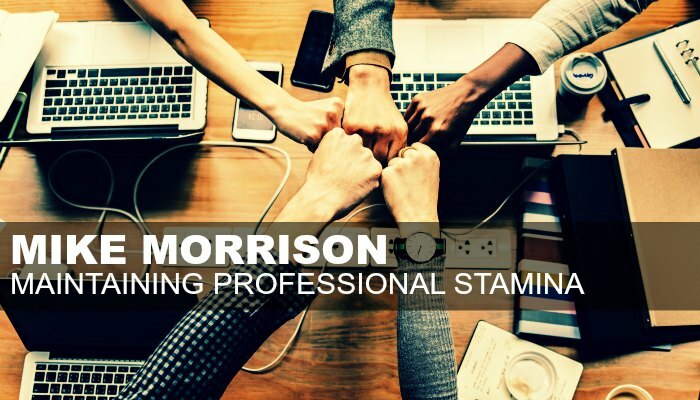 If you would like to know more about Mike's presentations and his keynote topic Professional Stamina click here, or call us today for more information 1300 55 64 69.